So it's April 30th PBers. Like practically Summer and all of Paris is still wearing their BOOTS!? What's up with that? I shot these pics this morning. 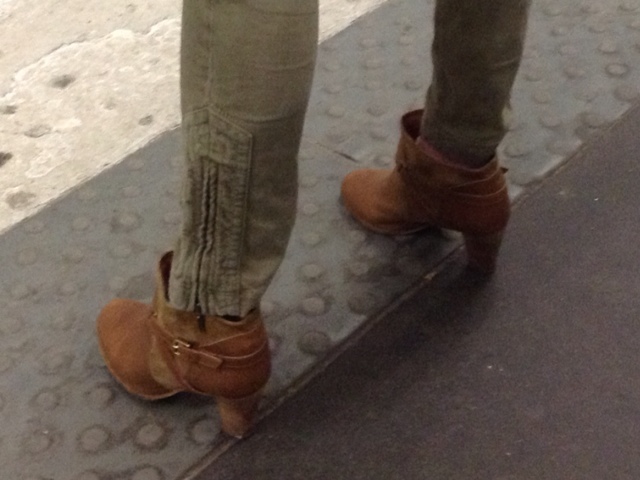 It's in the 50's and sunnyish so why all the boots Parisians? If you just arrived in Paris and didn't bring your boots, turn around and go home. Get em! I mean it. Parisians are dead-seriously dedicated to their boots. Boots with tights. Boots under jeans. Over jeans. You name it. Look! 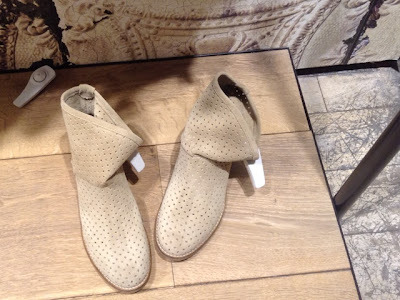 Galeries Lafayette wants you to buy Summer boots aerated with tiny holes. Bet that makes them super cool.. 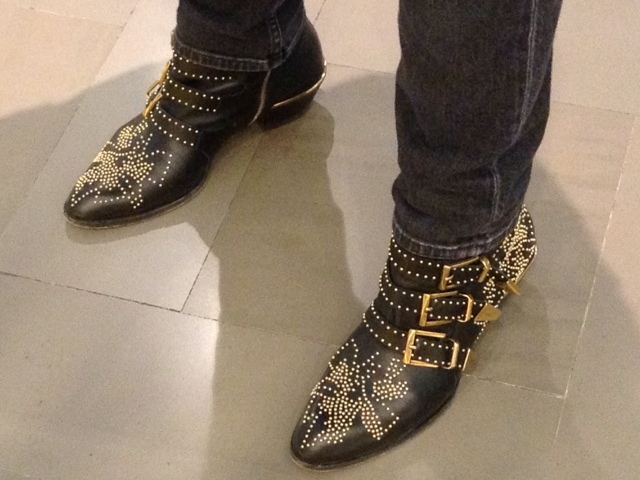 I asked this woman if I could shoot her Fab boots. No problem. I asked this Galeries Lafayette sales girl if I could shoot her bleu suede shoes? I said, "Oh, you know... 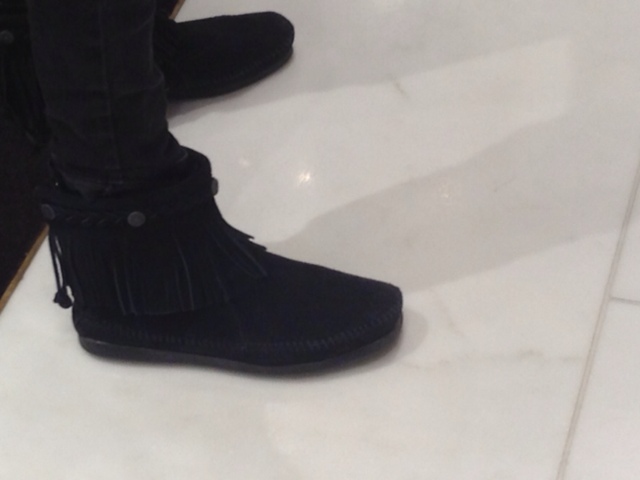 I have a blog..
Uggs in April in Paris!??? Who knew? 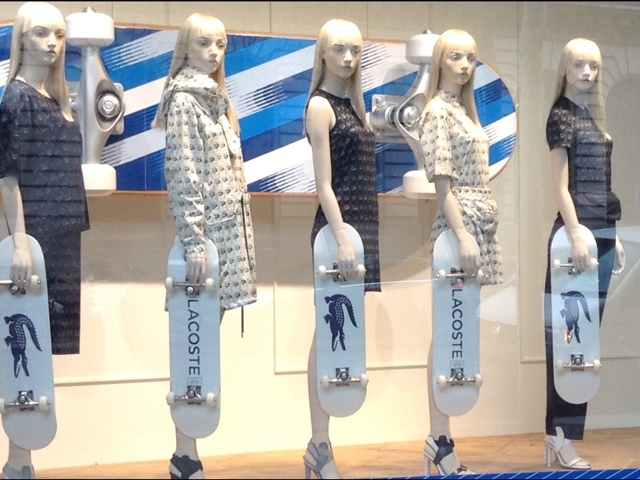 So what are Parisian girls gonna wear when the temperature rises besides skate boards? I'm holding my breath. It could be Boots. Qui sait? If you get what you want all the time it becomes boring don't cha know? Besides it was rush hour. A dessert that looks like a boot is hard to find. I just love to visit here...you give me such a nice dose of Paris...I'll be back in Nov. this year and boots will be perfectionnement!!!! You have helped me to make up my mind! 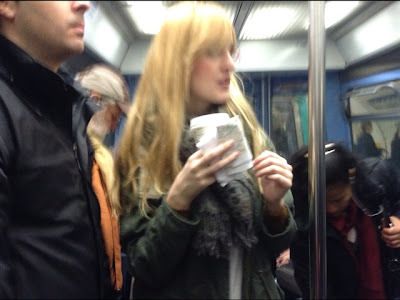 As for the woman sipping her Starbucks in public....well, I kind of like the fact she is just enjoying an innocent latte or maybe she is a true rebel! :Love your blog. It keeps me connected to a City and aesthetic that I love. It is freezing ! you know it is ! I am still wearing my boots too. à quand les sandales dorées ??? In NYC peep put their boots away April 1. Spring must be coming soon and help it along by shedding some of winters clothing is the premise. Can you see the big smile on my face? As they say "You speak to me". Those boots were made for walking, as the song goes ! I don't think you would see Parisians wearing walking boots !! I loved the fab. studded buckled boots and the shorty blue suedes just my style, but think my hubby would draw the line on the studded ones. 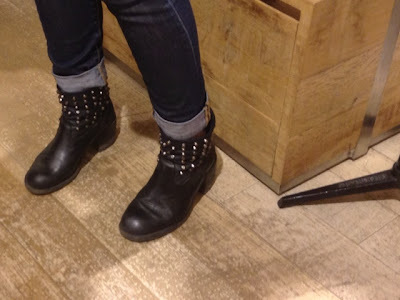 You made me laugh for asking the sales assistant could you take a photo of her boots, I can just vision the look on her face, her mouth would be pursed(faire la moue) & her nose would look as if it had a nasty smell under it. Oh my ! I'm sure she definitely thought you were from Mars. Keep it up. I love it & by the time you've finished your job, you'll have those Parisian ladies eating out of your hand. My favs are those beauties with incredibly high heels and gold leaves! My selection of shoes has (out of necessity) dwindled to those with an oversize toe box. I wonder if they'd ever come studded????? Oh,my.The joys of the troisieme age. J'adore this post, Carol! 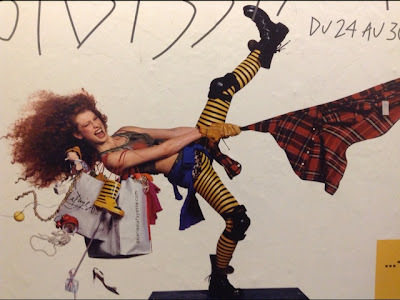 Post as many fashion pics as you can! (..and pastries, bear, and ever-so-sharply-dressed puppy dogs - bien sur!). I do just LOVE boots. (No studs though, please. Enough of that in the 80s) I cannot get over seeing Ugg Boots outside of the home - especially in Paris! Alors! Australia set them loose on the world several years ago, but I'm quite sure it was for a joke. :0) Best regards, Rebecca. OKAY! Stop the presses....how did I utterly miss that you moved to sweet Pah-ree!? This year I have the awesome privilege of homeschooling our 6 yr old and my, ahem, free time/blog time has been nearly nil. So for the first time in a long while I decide to see what new overseas excursion and delicious visual delights you have and you have PARIS, FRANCE under your profile picture as your locale and you talk about "months" being in Paris....CAROL! You did it! I know we have just been blog buddies but i feel giddy for you right now. Yippee! What joy it is to read your adventures and know you are right where you are meant to be. Now I am off to do some blog binge reading to catch up with what's been up with you...God Bless you dear Carol. I love it when you tell people you blog it just explains everything to them. teehee. Hey I'm a blogger and this a stick up! I'm coming to Paris and I'm wearing my big ugly comfy Nikes that scream "American" because I'm too cool to care, too old to date, and too tired to keep up with fashion. In NYC they are still wearing lots of amazing boots. But hey, its really hard to tell with all the tourists what real New Yorkers are into. 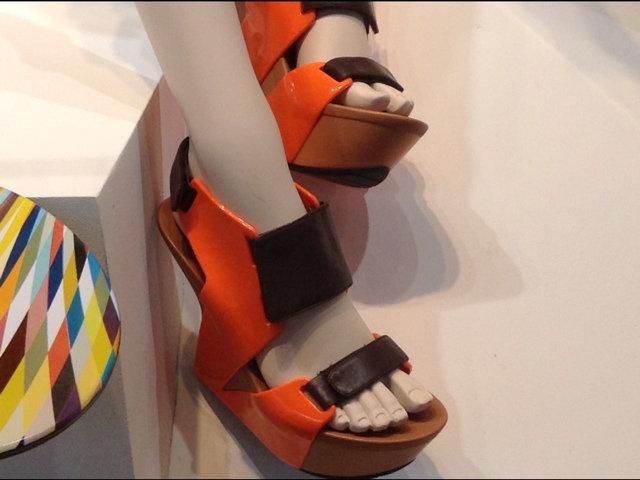 Lots of sneakers and LOTS of high heels that look crazy to walk in. Lots of shoes that probably cost $500 bucks . Seattle yesterday, also boots and Nikes. I would have said they're crazy but tomorrow, on May 2nd, they're forecasting snow here, after 3 days in the 80's...maybe the chic Parisian is just prepared! Yet another great post. I love how you interpret the city for us. The boots are all so stylish- well except for the ugg boots, definitely for inside, not for outside.